The call of God comes in different ways and when God calls, He has a particular mission He wanted to achieve through the human instrumentality. When we turn the pages of the scriptures beginning from the Old Testament down to the New Testament, we will discover that the call of God has an end in view. Take for instance the call of all the prophets both minor and major prophets. One obvious thing with the call of God is that He is not calling because one is qualified but rather He calls to qualify. This means that the unqualified are called to be qualified. Priests, Prophets and Apostles from the biblical accounts were neither called because they were qualified nor chosen because they were worthy, all is done out God’s gratuitous kindness and grace. He called those who are nothing in the ordinary sense of the word and in the human calculation to make them something from nothing, to lift them up from grass to grace, from nobody to somebody because of a particular mission He wants to achieve through them. God called those who lack all it takes to be prophets, to be priests, to be apostles and so on, to provide them with all the necessary material needed to function. This brings us closer to the word of God in the prophet Isaiah that says “For my thoughts are not your thoughts, neither are your ways my ways, said the Lord” (Isaiah 55:8). The liturgy of today presents us with the three big biblical figures that contributed immensely to our faith and how they were called. We see this in the call of Isaiah in the first reading, that of St. Paul in the second reading and St. Peter in the gospel. These three were neither called because they were qualified nor chosen because they were worthy but the grace of God instantly transformed them and elevated them to the enviable position we see them today. There are three fundamental things that characterize the call of these three figures in the readings of today. One is the acknowledgement of their sins and their unworthiness. This acknowledgement goes with humility. The second characteristic is the change of their profession and the third characteristic is their willingness to take up the responsibility of carrying out the mission upon which they were called. “see now this has touched your lips, your sin is taking away your iniquity is purged. Then I heard the voice of the Lord saying whom shall I send and who will be my messenger? I answered “Here I am, send me (Isa 6:7-8). The same follows the call of St. Paul. In the second reading of today, Paul in humility narrates how he persecuted the early Church and how the grace of God made him what he is. He says “I am the least of the apostles, in fact, since I persecuted the Church of God, I hardly deserve the name apostle, but by the grace of God, I am what I am (1Cor 15:9-10). We can as well see here that Paul acknowledged his sins and through the grace of God, he was provided with all the material needed for his apostolic mission and mandate. After being empowered, he immediately took off to actualize that mission by which he was called and part of it is his message we are reading today. Lastly, in the gospel, we see the encounter between Jesus and Peter. After seeing the miracle of the great catch, Peter was highly perplexed and as a result of this, he fell down at the knees of Jesus saying, “Depart from me Lord, for I am a sinful man” (LK 5:8). Like in the case of Prophet Isaiah in the first reading and that of St. Paul in the second reading, immediately Peter confessed his sins and acknowledged his unworthiness, Jesus Christ empowered him by saying “Do not be afraid, from now on, you will be catching men” (LK 5:10). Automatically, his profession was changed from fisherman to fishers of men, what a wonderful encounter and transformation! In all these analyses, we can now see the connection between the acknowledgement of one’s sins and the power of the grace of God changing one condition to a better condition. Isaiah did it, his condition was automatically changed, Paul did the same, his condition as a persecutor of the New Way changed to propagator of the Good News and Apostle of the Gentiles, and Peter in the gospel also acknowledged his sinfulness and unworthiness and the grace of God instantly changed him from fisherman to fishers of men. The question now is, how often do we acknowledge our sins, how often do we accept our unworthiness so as to give room for the grace of God to transform us and make us better persons. Here comes in the sacrament of Reconciliation. One of the virtues that draws us to this sacrament is humility. It is only humility that makes us when we fall short of the glory of God, to come to Him and say Lord have mercy on me for I have sinned against you. 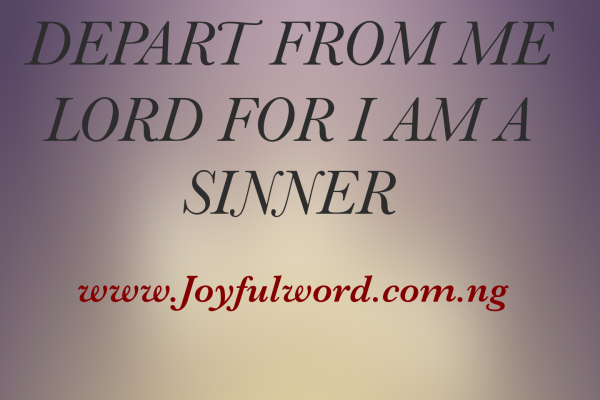 A proud person cannot accept that he/she has sinned and needs the grace of God. God always works with those who humble themselves and it is through this act of humility that His grace will instantly transform our present condition to better a condition as we see in these three great personalities of today’s liturgy. Secondly, obedience to the word of God is another powerful element that brings about positive result and change in our lives. Let us always ask for the grace of humility so as to be able to acknowledge our unworthiness and sins so that the grace of God will operate in us to transform us and to make us better Christians. Let Us Pray: Lord Jesus Christ, I acknowledge my sin before you and I cannot help myself. Forgive me my sins and give me the grace to become a worthy instrument in your hands. Amen.